Not that we haven’t known that for some time but it was recently drilled home to me on my flight back from Madrid last week. My son Enrique has asthma. He got quite bad with it earlier this year when we were in Spain and a Spanish doctor prescribed a cough suppressant called Expectu to help him sleep. When I was in Madrid, my wife asked me to get another bottle of Expectu to bring home. So far, so good. Except, the bottles for sale in the pharmacies were 200ml and you can only bring bottles less than 100ml onto the plane (I only had hand luggage). What did I do? I asked the pharmacist to decant the 200ml of Expectu into smaller bottles (in dreadfully pidgen Spanish!). He obliged and poured it into four 75ml bottles. I put these bottles into a clear plastic bag along with my deodorant and toothpaste fully expecting to be stopped at the airport. Not a bit of it. Going through security, the guard took out one of the four bottles, checked the volume of it and, satisfied that it was less than 100ml, replaced it in the clear plastic bag! Fantastic! 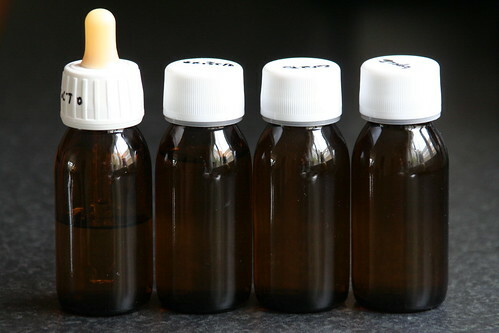 For all you aspirant terrorists out there making liquid bombs – decant the bombs into small bottles if you want to get them onto the plane and you are sorted (oh, and just in case you thought I was serious, here’s why you should save yourself the trouble of trying to make a liquid bomb)! There is a version of it on the Mac site here (.mov) and there are two similar ads on this page on the Apple site. Good buddy Dennis Howlett has uncovered, through some clever financial detective work (Dennis is a former accountant), some very dodgy dealings. It seems that the CEO of Symantec, John Thompson, made $1.5m profit on the sale of Symantec shares very shortly before the announcement to the market of losses by Symantec (and the inevitable share price fall that ensued). This looks very bad and reeks of insider knowledge (whether or not that is, in fact, the case). Companies engaged in security need to be whiter than white. When the CEO’s reputation is on the line like this, Symantec needs to explain this one quickly to everyone’s satisfaction of John Thompson needs to resign. 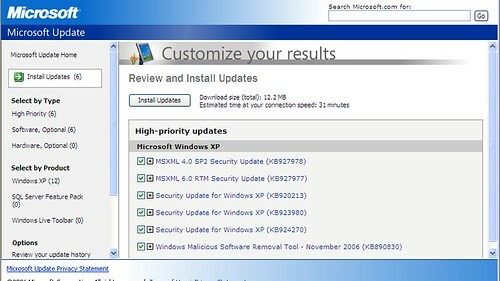 Microsoft released updates for critical vulnerabilities in Windows (2000, XP and 2003). This includes fixes for three vulnerabilities that “criminal hackers are already exploiting” according to Brian Krebs. The patches fix vulnerabilities which can allow remote code execution (it doesn’t come much worse than that!). WordPress was updated to version 2.0.4 over the weekend. This release contains several important security fixes, so itâ€™s highly recommended for all users. Weâ€™ve also rolled in a number of bug fixes (over 50! ), so itâ€™s a pretty solid release across the board. WordPress 2.0.4 is available for download here.